Utah has the largest class sizes in the nation, and we spend the least per pupil. Our current funding model cannot adequately provide for the ever-growing number of students in our communities. Teachers are paid .70 on the dollar compared to others who earn a Bachelor’s Degree. On top of that, our state board recently approved yet another alternative licensing route that will result in even more teachers entering classrooms unprepared to teach. It’s no wonder more than 40% of our newest teachers leave in the first five years. As a veteran educator and teacher leader, I am angry about the seemingly willful disregard of our situation by policy makers. Conversations regarding salaries, licensing, funding and teacher prep are generously reported in the media, but progress feels painfully slow. Exhausted by their efforts in the classroom, our teachers have little passion left to speak out and share their stories. Yet we cannot escape this important truth: our profession desperately needs teachers willing to lead the difficult discussions. We need teacher leaders. 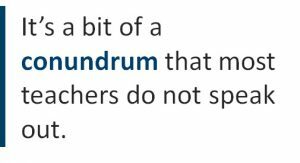 It’s a bit of a conundrum that most teachers do not speak out. Teachers—the very professionals who enjoy the spotlight—often hesitate to voice their opinions or share their stories to a broader audience. We feel intimidated speaking to policy makers and are often complacent, often believing our local associations will speak for us. A glaring truth is that many policy makers discount the messages of associations, insisting they already understand the issues that unions will push back on. As a result, individual teacher voice is missing from important conversations. We could confront the onslaught of attacks from those who would dismantle traditional public education if more teachers were willing to step out of their comfort zones and speak. Teachers must own their profession. They must lead their profession. To change the narrative around public education, it is imperative that we enlist new voices. We must seek out opportunities to remind teachers of their immense importance and help deepen their pride in the hard work they do each day. Teacher leaders, whether in person or online, can inspire other educators to speak. Here are strategies we can use to encourage them. Professional Memberships – Invite teachers to join professional organizations that will offer them opportunities to lead and speak. Many associations have leadership initiatives, interactions with state and local government, and training opportunities that can help educators practice speaking up and strengthen their voices. Expertise – Help teachers to begin to lead by asking them to share their innovative approaches with colleagues in their schools, districts and online. Highlight their efforts and ideas wherever possible, and suggest other opportunities where they might speak, such as at state and national conferences. Connections – Offer ideas for initiating conversations with policy makers through email and social media. Encourage teachers to invite policy makers to visit their classrooms so they can see the reality of the educational challenges in their areas. Bring colleagues along when you get the chance to speak to those who make critical decisions. Modeling – Inspire teachers in your area by grabbing the mike and sharing your own story! Teacher leaders have ample opportunities to speak both in person and through social media. At your next event, take a moment to focus on the purpose and importance of teacher leadership. 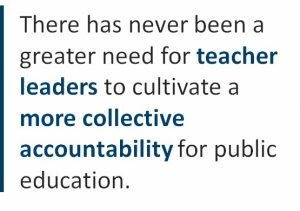 As we anxiously await the changes to our national department of education, there has never been a greater need for teacher leaders to cultivate a more collective accountability for public education. And so, how will you inspire potential teacher leaders? What platform will you step upon with your message? Who will hear your inspiring words of confidence in your own abilities as well as the entire education system? Where will you begin to share your message of hope for our students? As a teacher leader, your voice is powerful. Your words can make the difference in a novice teacher’s decision to stay or leave. Time to step up on that stage and inspire others to stay and lead.